We’ve been having internet issues the last couple of days. The satellite internet we use has a daily transfer limit on the amount of information you can up- or download, and we went over. It’s not a very high limit, and a bit of unusual high-bandwidth activity can and usually does push us over the top. 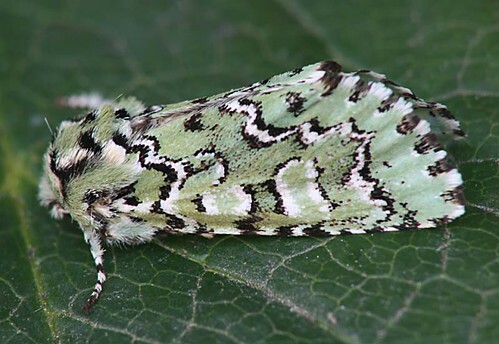 I think the other day it was because I was accessing a lot of photo-heavy moth identification websites as I was working on some stuff for the guide. Whatever the reason, once over the threshold our transfer speed slows to a crawl. It’s supposed to be dial-up speed, but in reality it’s less than half that. So needless to say, I haven’t done a lot of internetting during the down period. We’re back up and running now, however. Thank goodness. I’ve been rather absorbed with the moth stuff in the meantime. I’m starting to get that pre-spring excitement that always begins to build as we roll into March. We’ve had a few mild days where I could actually smell spring in the air. 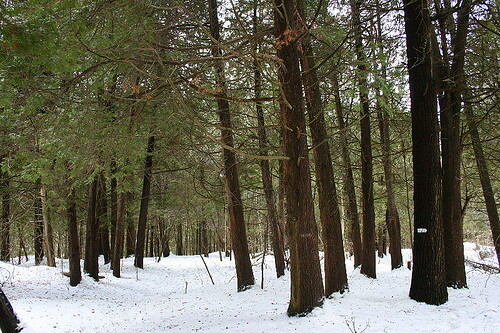 There are patches of bare ground exposed in areas. The temperatures have dropped again (it’s -15 C, 5 F, as I type this), but we’re on the homestretch. I might even be mothing again in less than a month! In less time than that we should have bird migrants arriving. Red-winged Blackbirds, three weeks. 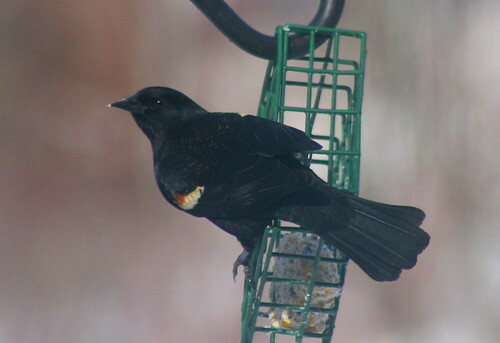 Red-winged Blackbird at the suet, last spring. In the meantime, a couple of things. The first is that Festival of the Trees #33 is now posted at Local Ecologist. I didn’t get a post in to this carnival, unfortunately. I had grand plans to do one on either Black Cherry or Black Spruce in recognition of February being Black History Month, but the Black Spruce around here are only accessible by boat (and the lake is frozen, but not frozen enough through that area to hike across), and it turns out there are no Black Cherries in our woods here, or at least not the ones immediately surrounding the house and lake. And then I got caught up with other topics, and, well, it just didn’t happen. However, I will be participating in the next one. I know this for sure, because I’ll be hosting it. I’d love to have your posts included in it! Send me a link to sanderling AT symbiotic DOT ca or use this handy online submission form. And the second is that I was tagged by Voice of the Turtle last week on a meme entitled Ten Honest Details (she expanded it to include 15). This is my response to the tag. Anyone else who wants to participate is welcome to join in! 1. I have pointy feet. My family jokes that they were made to fit into those pointy-toed shoes that are so in fashion these days. 2. I follow football, the NFL sort. I don’t mention this often because, as a female, I tend to get funny looks. Especially since growing up I was very much not into sports at all. I got into it when first dating Dan and wanting to show interest in the things he likes (you know, trying to impress the other person in those initial months). Little did I know I’d get myself hooked. I root for the Atlanta Falcons. I have a small tv-crush on Matt Ryan. 3. Speaking of getting hooked, when I was hired for my very first bird job, I had just been looking for something in the field of biology, and figured birds was as good as anything. I had connections to the job and was offered it by that route, not because I was supremely qualified. In fact, I knew very little about birds at the time. That was in 2000; I’ve come a long way since then. 4. I am a tea-drinker, and have developed a preference for Twining’s Earl Gray. I dislike coffee, although I’ve taken a liking to Tim Hortons’ Iced Capp. In mint flavour, preferably. 5. I enjoy superhero shows and movies. My favourite show on tv at the moment is Heroes, despite what many feel is a deterioration in the quality of the writing/plot. If I could have an ability, I’d want to fly. In my dreams I often fly. I love it, and if I’m in that hazy half-sleep, I try not to wake up when I’m dreaming about it. 6. I am a horrible procrastinator. I wish I was one of those people who just took care of things, but I seem to have a mental block that prevents me from taking the step between recognizing that something needs doing and getting up and doing it. Like watering the plants. My peace lily is usually drooping for a couple of days before the poor things get watered. Strangely, they thrive on this regimen. Said peace lily is currently putting out some blooms. 7. I’m one of those women who feels the cold. If heating costs were no object, I would keep my house at 25 degrees Celcius (77 F) year-round. I find 21 degrees to be on the chilly side, and my hands and nose will actually get cold at that temperature if I’m just sitting at my computer. Unfortunately, it’s hard to keep the house at 25 when you’re heating it by wood stove. 8. I used to read like a fish. Sadly, I’ve fallen out of the habit a bit in recent years. I still try to get some reading in, but I always seem to have other things to do. In the last few months, it’s been mostly work. Blogging, moths, book stuff, whatever. At least I enjoy my work. 9. My favourite actor is Johnny Depp, and my favourite actress is Judi Dench, both for their acting abilities (do you think the fact that they’re both J.D. is coincidence?). I’ve loved every movie either has done, but particularly Johnny Depp. I can’t decide if I liked him more in his role as Willy Wonka or Captain Jack Sparrow. 10. I hate the smell of frying mushrooms. Ugh. Gag. We share some common interests, like #5 and #6! Are you as excited about the Watchmen movie as me? Ha. #3 gives me a boost in confidence because I want to do something in biology too, and because I am just a beginner birder too. Have fun mothing in Spring. Sounds exciting! I was missing you!!! Love that picture of the Joker. Man, that’s one beautiful moth! I saw that you were hosting the next Festival of Trees. I was very excited for you. I appreciated your encouragement re: the arrival of spring (as I look out the window to MORE snow falling). You’re right. It’s March. There’s no stopping it now! It does look like it has potential, PSYL – although I’ll probably wait for it to come out on DVD, since we just never make it out to the movies now that the closest theatre to us is 45 minutes away. I would suggest checking out BirdJobs listings if you’re serious about finding a job in birds and don’t mind travelling. A lot of these jobs take biology students with little previous experience, most pay decent (though you’ll probably be doing it more for the experience than the money), and they are great for learning more about field techniques, and getting your foot in the door places. I’m glad to know I’m missed, KaHolly! I’m pleased you like the Joker so, moths can be a hard sell to folks. It won’t be long now, I can almost smell the fresh, damp earth warming in the sunshine! I started enjoying hockey once my son’s father had explained it a few times, but I don’t remember anymore. Right with you on #9! Johnny Depp as Don Juan di Marcos, or as Benny, or as JM Barrie, or as Edward Scissorhands, or… yep. Very nice Atlanta Falcons information. I hope to be in Atlanta for a game this summer. I really liked your blog with the Falcons mention! Super Bowl maybe this year?! ?